Particulate matter is a designation for a large variety of extremely small particles of organic and inorganic origin. They can contain carbon, metals, ash, soot (almost purely elemental carbon), acids such as sulphates and nitrates and carbonates. Some PM consist of partly combusted or non combusted hydrocarbon material (fuel and lubrication oil) and there is an overlap between the designations of PM and HC. Ash from fuel and lube oil is only a minor component of the emitted PM and come mainly from metals (vanadium and nickel) present in those oils. In air quality terms also pollen, spores, viruses, debris, ocean salt spray and dust are categorized as particulates, but here particulate matter is a result of combustion of fuel oil. Volcanoes and forest fires are other sources of PM, but particle emission caused by human activity by burning fossil fuels is a major contributor. To formation of PM takes place in steps of growth which is illustrated in figure 45. The first stage consists of extremely small particles of mainly soot (carbon) formed in the fuel rich zones in the combustion chamber. Afterwards other substances adhere to the soot particles and the particles start to grow. They collide with each other and the number of particles is reduced, but the particle size increases. Some of the formed PM will be combusted during the combustion process. In the exhaust system where the exhaust gas is cooled the less volatile substances condensate. SOX can react with water, condense and form sulphuric acid which adheres to the particles as a liquid film (figure 45). 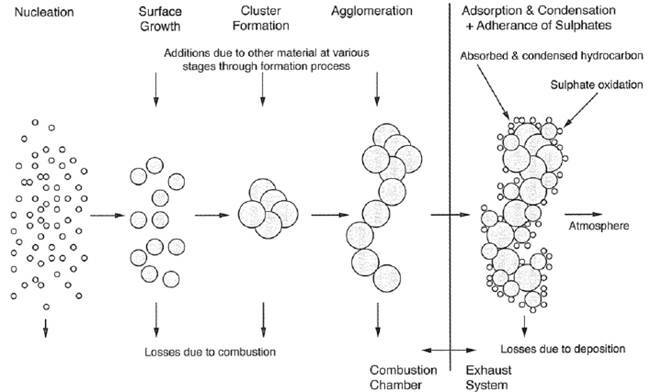 Figure 45 – PM formation process during and after the combustion process. Particulates are a result of incomplete combustion, dirty fuel oil and imperfect lubrication of the cylinders. At low and transient loads soot can be a high contributor to the total PM emissions while at higher loads the fraction is much smaller. Because the PM emission depends on the load, the fuel oil composition, and the lubrication oil type and dosage it is difficult to establish general emission rates for PM. 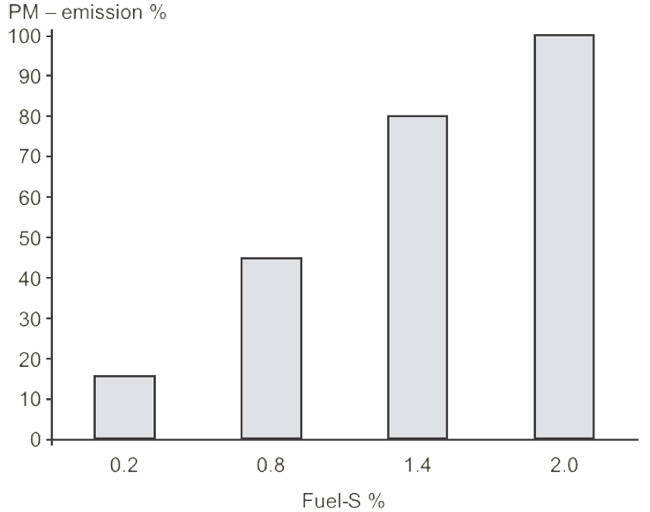 The sulphur content on the fuel has a large influence on the PM emissions as illustrated in figure 46. Figure 46 – PM emission as function of sulphur content in the fuel oil. From MAN Diesel & Turbo. Particles from marine fuel oils are normally in the small end of the size range, while deposits from the combustion chamber and exhaust system are much larger. Generally the size of the particles from burning heavy fuel is larger (PM10) than from burning distillates (PM2.5 – PM1). The size of the particles determines how dangerous they are to humans. The particles that are smaller than 10 m in diameter can be inhaled by humans and the smaller the size the further the particle can penetrate into the lungs. Some may even get into the bloodstream and can cause serious health problems. Smaller particles can furthermore be carried with the wind over larger areas. The PM containing large heavy aromatic HCs (PAHs and PAH nitrogen combinations) pose a greater risk to human health, because they are carcinogenic. The small particles can be transported by air and the effects of PM pollution can show up far away from the source of the pollution. The lifetime of PM in the atmosphere is long compared to e.g. SOX. Background concentration of PM is about 20 30 µg/m3 but can be much larger in trafficked areas during peak periods. From a climate point of view emissions of PM are of concern in polar areas because the black carbon particles enhance the absorption of infrared radiation and thus contribute to the accelerated melting of ice at the poles.